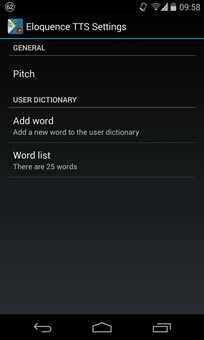 Android version of the popular Eloquence Text-To-Speech synthesizer. 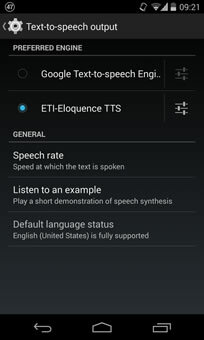 ETI Eloquence is an Android ported version of the popular Eloquence Text-To-Speech synthesizer. Code Factory believes in developing simple yet powerful solutions that help users enjoy the mobile experience and be productive in their personal as well as professional lives. Screen readers and applications for blind people (like Talkback or Mobile Accessibility). E-book readers (like Play Books). 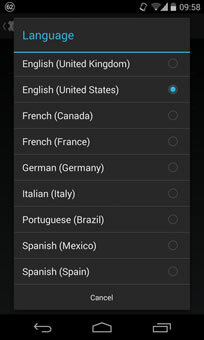 10 languages included with a single purchase: US English, UK English, Spanish (Spain), Spanish (Mexico), German, Finnish, French (France), French (Canada), Italian and Portuguese (Brazil). 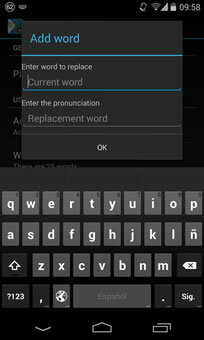 Once the application is installed on your device, you can make ETI-Eloquence your default TTS engine by going to Settings > Language & input > Text-to-Speech output and checking “ETI-Eloquence TTS” as your default preferred engine.